"Clergy members led several hundred people on a march Monday, using a bullhorn to read the names of people killed by police nationwide, in the Missouri city where protesters have been unremitting since an unarmed 18-year-old was fatally shot by a police officer. ... At least eight people were arrested, including renowned academic and activist Cornell West. "The march marked the third straight day of organized rallies in Ferguson. Protests have been common since Brown, who was black, was killed by a white police officer on Aug. 9. But tensions escalated last week when a white police officer in nearby St. Louis shot and killed 18-year-old Vonderrit Myers Jr., who police say shot at police before he was killed. Since Brown's death, three other fatal police shootings of black males have occurred in the St. Louis area. Myers died Wednesday after a confrontation with a white St. Louis officer, whose name has not been released. Police said the officer fired 17 rounds after Myers opened fire. Myers' parents say he was unarmed, and many speakers at a weekend rally echoed those doubts and raised concerns about racial profiling." What happens if the Grand Jury fails to indict Officer Wilson? The situation is persistent proof that racial tensions in America haven't really changed in the last 50 years, Truthseeker. The Civil Rights movement succeeded in changing the laws, but not the hearts and minds of many of our fellow citizens. And we will also spend some time on the Ebola crisis, ironically, on the day when we celebrate Columbus' "discovering" of America, and bringing smallpox and countless other deadly viruses with him for the indigenous people to enjoy. While the Neocons continue to point fingers at the Obama administration for somehow falling down on the job where it concerns the outbreak -- they conveniently forget that their Senators failed to confirm Obama's pick for Surgeon General, leaving that important post vacant, and they also cut public health funding to a point where efforts to contain an outbreak -- or create a vaccine -- are hampered. Dr. Francis Collins is the head of the National Institute of Health. "As the federal government frantically works to combat the Ebola outbreak in West Africa, and as it responds to a second diagnosis of the disease at home, one of the country's top health officials says a vaccine likely would have already been discovered were it not for budget cuts. 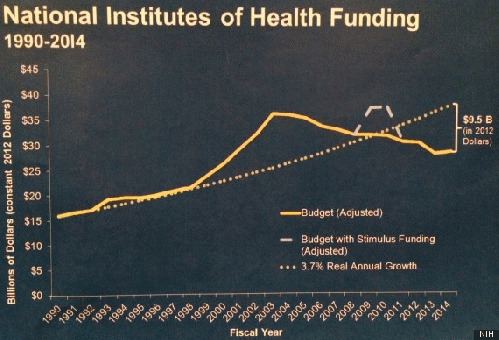 "Dr. Francis Collins, the head of the National Institutes of Health, said that a decade of stagnant spending has 'slowed down' research on all items, including vaccinations for infectious diseases. As a result, he said, the international community has been left playing catch-up on a potentially avoidable humanitarian catastrophe. "It's not just the production of a vaccine that has been hampered by money shortfalls. Collins also said that some therapeutics to fight Ebola 'were on a slower track than would've been ideal, or that would have happened if we had been on a stable research support trajectory...We would have been a year or two ahead of where we are, which would have made all the difference,' he said." None of these facts will deter the Rapture Right from asserting that the Ebola threat somehow must be Obama's fault.